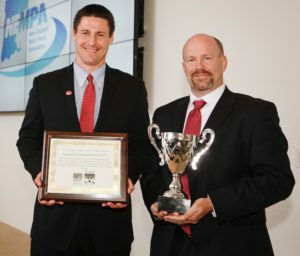 At its annual awards dinner, held at the MIT Media Lab on May 26, the New England Motor Press Association honored individuals for their outstanding contributions to the automotive industry and awarded the 2016 winners of the NEMPA Ragtop Awards and Winter Vehicle Awards. 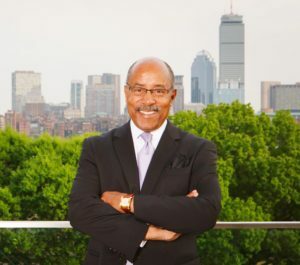 Ed Welburn was named Vice President of GM Design North America in 2003, becoming the sixth Design leader in GM history. In 2005, the position became global. Welburn is the first African American to lead a global automotive design organization. He will retire this summer after a 44-year career. Welburn created a network of ten Design Centers in seven countries. His team of over 2,500 design and development every GM concept and production car and truck globally. Welburn was an intern at GM in 1971. He joined as GM’s first African American designer in 1972 with a BFA from the College of Fine Arts at Howard University. In his early career, Welburn designed the Oldsmobile Aerotech, which set land speed world’s records. As one of the most celebrated auto execs in our time, Welburn was named the 2015 Black Engineer of the Year and has received honors and special recognition from many organizations, including Rainbow PUSH, Ebony Magazine, the Automotive Hall of Fame, Wheels Magazine, The Detroit Free Press, The Michigan Chronicle, The Detroit Historical Society, and the Trumpet Awards. Jennings first learned about cars at the kitchen table from her father, who was editor of Automotive News. She went on to become an owner/operator of a Yellow Cab in Ann Arbor, Michigan, and then worked at Chrysler’s test track, where she worked as a test driver, welder, and mechanic in the impact lab. In 1980, she was hired as a writer at Car and Driver magazine, and in 1985 she left to help found Automobile Magazine as its first executive editor. She became Editor in Chief in 2000 and President in 2006. She now focuses on the website that she created—Jean Knows Cars—and her car reviews and videos are syndicated by Tribune Publishing. 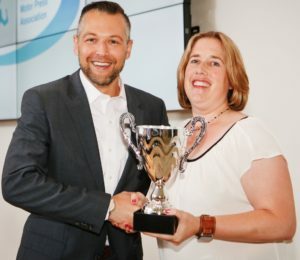 Jennings has won awards for her feature writing, her car reviews, and her monthly Automobile Magazine column, “Vile Gossip,” including the 2007 Ken Purdy Award for Excellence in Automotive Journalism. She was the subject of a Susan Orlean profile in The New Yorker, appeared on The Tonight Show with Jay Leno, and was Good Morning America’s automotive correspondent from 1994 to 2000. Jennings is a regular on-air contributor to broadcast media including Fox Business Network; CNBC’s Closing Bell, Squawk Box, Behind the Wheel, and Power Lunch; MSNBC; CBS’s This Morning and Evening News, and CNN’s American Morning and Headline News. The New England Motor Press Association’s 2016 Camel’s Back Award goes to Rob Moran, a consummate public relations and communications professional, for his years of work in the industry. Robert Moran became director of corporate communications at Mercedes-Benz USA (MBUSA) in August 2013. In this role, he leads corporate communications strategies and initiatives for the company’s U.S. operations, reporting directly to President and CEO Steve Cannon. Specific responsibilities include directing media relations for product, brand and corporate communications. 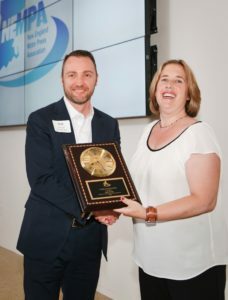 East Coast Communications Manager for Toyota Motor North America accepts the Yankee Technology Cup from Vice President of NEMPA, Nicole Wakelin. The Yankee Technology Cup is presented to an automotive feature or system that significantly enhances the motoring experience, whether by making driving safer, more cost-efficient or simply more enjoyable. The winner is selected with input from MIT faculty. Toyota Safety Sense is an innovative package of driver-assist technologies that detects obstacles and automatically applies brakes to avoid collisions. Using an in-vehicle camera and front-grill mounted millimeter-wave radar, the latest version of TSS—TSS P—enhances the functionality of this safety technology in three notable ways: Pedestrian Detection, Steering Assist, and Dynamic Radar Cruise Control. 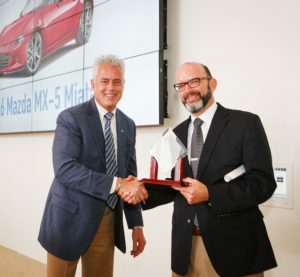 Selected by NEMPA members, this honor goes to the automotive supplier that has made significant contributions to the industry. Often suppliers are the unsung heroes behind the major advancements in the business. Suppliers can be nominated for a component, system or technology that significantly enhances the motoring experience, whether by making driving safer, more cost-efficient or simply more enjoyable. In March of 2015, Delphi executed the first ever cross country / coast-to-coast drive of an automated vehicle. This game-changing demonstration showed the world what’s possible in the automated driving space. The vehicle made the trip from San Francisco to New York in 99% fully autonomous mode. The vehicle proved that with the right technologies, partners, talent and passion for automotive safety and technology, no obstacle is insurmountable. Delphi was able to retain the design and aesthetics of the vehicle after integrating all of its active safety and ADAS technologies to enable automated driving. During the trip, they were able to collect more than 3 tera bytes of data, which has helped the company to accelerate development of these lifesaving technologies. Since then, Delphi has continued to use its automated vehicle for testing purposes, continuously pushing the envelope and collecting more than 50 tera bytes of data. With a milestone drive such as this, we were able to clearly point to increased interest from a variety of constituents across the board. We were able to leverage these “hot and on-trend” technologies to drive ideological leadership with customers, investors, media, government, influencers, etc. 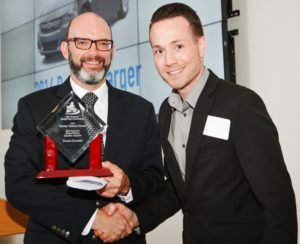 Eric Wingfield, Mobility Strategist for Ford Motor Company accepts the Ritvo Design & Elegance Award for the Ford GT presented by Zachary Dollar of the Museum of Fine Arts, Boston. Selected with the Boston Museum of Fine Arts and the Larz Anderson Auto Museum, this award honors the best in automotive design. It is named for the late Gene Ritvo, a veteran concours photographer and NEMPA member who had a keen eye for elegant design. You see lots of convertibles on our roads when the snow finally melts, and the car of choice among those drivers increasingly has become the redesigned Ford Mustang. NEMPA chose the Mustang as its Best Convertible. This was a very good ragtop to start with, but Ford’s current version has raised the bar with its combination of performance, handling, interior quality, and great looks. It’s a great and responsive cruiser with any of the 3 available engines. The EcoBoost 4-cylinder and the standard V-6 are fun to drive. But the GT V-8 is the Mustang’s piece de resistance—giving owners not only a true muscle car but additionally one with all the technology and refinement of today’s best rides. This truly is a lifetime achievement award. All you need to do is head out on a nice summer night and you’re going to see a rolling history of the Mazda MX-5 convertible. And why not? They’re at their best “Zoom-Zooming” on a twisting road with the top down. Seeing a 20-year-old Miata with pop-up headlights is sure to make you smile. Mazda had a winner with the Miata right from Day 1 and has kept the celebration going. 2015 brought us the 25th Anniversary Edition, the vehicle that joined the New England Motor Press Association’s annual Ragtop Ramble (and Crustacean Crawl) last July. We’re looking forward to celebrating this summer’s Ramble with the all-new 2016 MX-5 Miata, a redesign that has kept both the simplicity of a snug, two-seat roadster while adding contemporary technology and refinement. Simply put, the SL-Class roadster makes a pair of statements. It certainly says “I’ve made it.” But it goes one step farther by declaring, “AND I know how to enjoy it.” The New England Motor Press Association doesn’t make its “Best Luxury Convertible” award lightly. There are some amazingly accomplished competitors out on the road, but none is able to combine effortless performance and refinement in quite the way the SL-Class does, starting with the three-piece glass retractable hardtop. The SL-Class essentially performs as a coupe with the top up, but it really comes into its own cruising with the top down. This roadster is available in four trim levels. The SL63 AMG version that joined us on last year’s Ragtop Ramble is exceeded only by an SL65 AMG. All trims have head-turning looks with increasing levels of neck-straining performance. This truly is one of the world’s finest automobiles. After a winter of driving dozens of contenders, the voting members of the New England Motor Press Association selected their top winter rides, the vehicles that offer the best combination of winter-specific features and options plus the dynamic qualities that make for safe, enjoyable and competent all-weather driving. 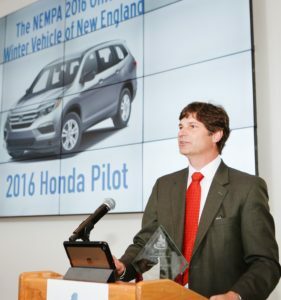 Rudy Mayne, Principal Engineer & 2016 Honda Pilot Engineering Design Leader for Honda R&D Americas, Inc addresses the crowd at the NEMPA Annual Awards Dinner on May 26, 2016. The New England Motor Press Association has selected the redesigned Honda Pilot as its 2016 Official Winter Vehicle. NEMPA members know that a snowy winter morning is guaranteed to turn New Englanders’ thoughts to a warm getaway. For most of us, that doesn’t mean a plane ticket to a Southern destination. Instead, what New Englanders want AND need is a safe vehicle—preferably one with heated seats, all-wheel-drive and a heated steering wheel. Our Winter Vehicle of the Year is equally ready for a sloppy slog to work or a trip over snow-covered roads to the mountains. The 2016 Pilot effortlessly accomplishes all this as the third generation of Honda’s popular mid-sized crossover. Its car-like ride and three-row seating help continue the Pilot’s family-friendly traditions. In addition, Honda’s proven 3.5-liter V-6 with “variable cylinder management” now is mated with a 9-speed automatic transmission on the upscale Touring and Elite versions. When it’s needed, the Pilot’s intelligent variable torque management system can “overdrive” extra power to the rear wheels to enhance handling. New Englanders have embraced the Subaru brand for decades. Now, the entire country has discovered these all-wheel-drive vehicles as Subaru has posted consecutive month-over-month sales growth for 4.5 years now. 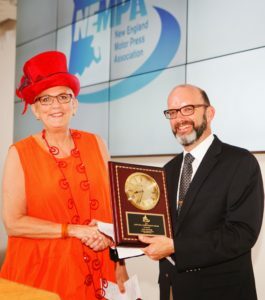 The New England Motor Press Association’s members also have been admirers. They’ve voted the Subaru Outback as the Best-in-Class All-Weather Sedan or Wagon priced under $30,000 for a second straight year in the group’s Winter Vehicle of the Year ratings. The Outback, which was redesigned for 2015, has its own niche—one that Subaru calls Sport Utility Wagon. For 2016, the Outback adds Lane Keeping Assist functionality to the Eyesight Safety suite that already features adaptive cruise control, pre-collision braking, and lane-departure warning. Outback’s class-leading fuel economy falls between 25 miles per gallon in city driving and 35 mpg on the highway. Add Outback’s proven Subaru all-wheel-drive, capable handling, roomy interior and functionality, and you have a winning combination. Dodge Brand Manager, Charger and Challenger, Ben Lyons accepts the award for the Dodge Charger from NEMPA President, Craig Fitzgerald. The New England Motor Press Association honors the 2016 Dodge Charger with the award as the Best in Class all-weather sedan or wagon priced between $30,000 and $40,000 in the group’s Winter Vehicle of the Year balloting. The Charger gets EVERYONE’S attention with its SRT 392 and Hellcat editions, making 485 and 707 horsepower respectively. That makes the Charger unique as a four-door muscle car. But to win this award requires a vehicle to be more all-weather friendly in a New England winter. That’s where the Charger’s 3.6-liter Pentastar engine and 8-speed automatic transmission shine, especially with all-wheel-drive. NEMPA members cited the Charger’s customizable driver display, user-friendly touchscreen, and array of available safety features including forward collision warning with full-stop capability, lane-keeping-assist, and adaptive cruise control. Still, if you really want to stand out, NEMPA members note you only have to look for a Charger with the Plum Crazy purple, Mango orange, or Sublime green paint job. New England Motor Press Association members wound up voting a split ticket in this category during their Winter Vehicle of the Year considerations. NEMPA named the 2016 BMW 750i X-Drive and Mercedes Benz S550 as dual winners of the Best-in-Class Award for luxury sedans and wagons. Where does one differentiate between these luxury sedans? Certainly not in pricing. Both will run into six figures and naturally come with all the technology, refinement, top-class materials, and design features that you’d expect in that segment. Both have long-wheelbase bodies and limousine-like interior configurations. If you want to drive yourself, each has refined and powerful engine choices, plus the latest in suspension refinements. In addition, they have you’ve got-to-see-it-to-believe-it luxury accoutrements in the cabin plus full safety systems. The Mercedes virtually can drive itself in traffic with smart cruise and active lane-keeping, not to mention an “inattentive driver” monitoring system. You pay your money and take your choice. We took our choice—and picked both. Nathan Hoyt, Product Communications Manager for Jaguar Land Rover North America addresses the crowd at the NEMPA Annual Awards Dinner. Gone are the days when your sports car had to go into storage for the winter. The New England Motor Press Association membership loves driving today’s sports cars in the winter and has voted the Jaguar F-Type its choice as its 2016 best-in-class sports car in Winter Car of the Year balloting. Jaguar has been a full member of the all-wheel-drive community for a few years now and has made all-wheel-drive available in the F-Type for 2016. That means F-Type drivers now can turn heads all year long. By any standard, the F-Type is an amazing package: The styling is unique and lovely, the interior is first-rate, and the technology is intuitive. The powertrains, both V-6 and V-8, are smooth and powerful. And, when you head down the road, you leave a wonderful exhaust note in your wake. The New England Motor Press Association recognized the Mazda CX-3 as its Best-in-Class sub-compact SUV/Crossover in 2016 Winter Car of the Year voting. The CX-3 reflects the industry trend of making premium features available in smaller vehicles. Drivers appreciate that the CX-3 combines the raised seating of larger vehicles with smaller overall packaging, making it a snap to handle in tight parking lots. Mazda also has infused the CX-3 with its Zoom-Zoom DNA, responsive handling, and good fuel economy. Even with all-wheel-drive it achieves 29 miles per gallon on the highway. Any all-wheel-drive version of the CX-3 gives New Englanders an outstanding choice for economical winter driving. The CX-3 is available in three trim levels—Sport, Touring, and Grand Touring. Blind spot warning and cross-traffic alert are widely available, and the top-of-the-line Grand Sport can be had with a full spectrum of features, including automatic high beams and windshield wipers, lane departure warning, adaptive cruise control, and forward collision mitigation with auto braking. 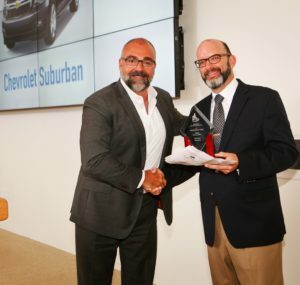 Alex Nunez accepting the award for Hyundai from NEMPA President, Craig Fitzgerald. The redesigned Hyundai Tucson can boast of receiving the New England Motor Press Association’s award as Best-in-Class SUV/Crossover that costs less than $28,000. The Tucson name may conjure visions of desert driving in Arizona, but NEMPA members found Tucson’s all-wheel-drive versions perfectly suited to New England’s winter driving conditions. This Tucson slots in as larger than a sub-compact, but it’s also on the small side for a compact vehicle. For 2016, Hyundai has let this 3d generation of the Tucson grow several inches in a complete redesign for its 3d generation. Voters took note of its exterior design—part of Hyundai’s lineup-wide Fluidic Sculpture. They also liked its 1.6-liter turbocharged 4-cylinder engine that makes 195 horsepower combined with a 7-speed dual-clutch automatic transmission. Passengers will appreciate the adult-friendly space in the second row of seats. All-wheel-drive versions also have active cornering control. 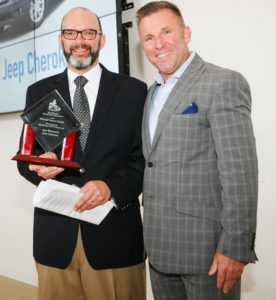 Tom Shanley, Director, FCA Northeast Business Center, accepting the award for Jeep from NEMPA President, Craig Fitzgerald. The Jeep brand always finds a place in the New England Motor Press Association’s Winter Vehicle of the Year voting because Jeeps ability to tackle tough conditions, either on- or off-road, is something that sets these models apart from the crowd. This year voters singled out both Jeep’s Wrangler and Cherokee models as the organization’s Best-in-Class mid-priced SUV/Crossover selection. There’s a new and old component to this. The Wrangler has been around through three generations dating from the mid-1980s…even though many among its legion of followers prefer to trace it to the iconic Jeeps built during World War II. Opt for a Wrangler and you’re buying into a lifestyle and community of off-road people who revel in the vehicle’s distinctive looks and seemingly intentional lack of contemporary refinement. They’re onto something because Wrangler’s resale values are the envy of the industry. However, if you want that off-road ability coupled with increasing amounts of refinement, you’ll find it in the Cherokee’s trim lines of Sport, Latitude, Trailhawk, and Limited. 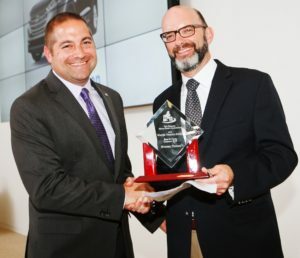 Andrew Brock, Dealer Operations Manager – New England accepts the award for Infiniti from Craig Fitzgerald, NEMPA President. 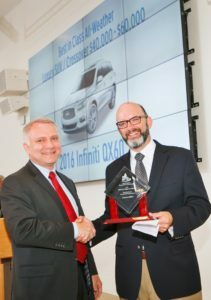 The New England Motor Press Association’s award for Best-in-Class all-weather luxury crossover/SUV goes to the Infiniti QX60. In New England, you have to be able to perform during winters in which Mother Nature throws cold, snow, and many variations of “slop” your way. The ability to deal with those conditions while comfortably carrying up to 7 passengers in 3 rows is a key component of NEMPA’s Winter Vehicle of the Year voting. As a family friendly solution, the QX60 fits the bill. A first-class interior and lots of technology are the QX60’s strong suits. Second-row seats slide and recline, making for relatively easy third-row access while making the ride easy on those in the second row. Infiniti changed the QX60’s transmission to a CVT for 2016, increasing fuel economy while creating software that mimics some traditional shift points. 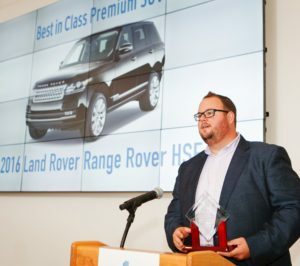 The New England Motor Press Association knew about driving in style when it voted the Range Rover LR4 HSE Lux as its Best-in-Class Premium SUV for 2016. The balloting was part of the group’s annual Winter Vehicle of the Year competition. Voters noted that the LR4 HSE Lux, while smaller than the company’s Range Rover Sport flagship, is similarly capable and luxurious. The LR4 is powered by a supercharged 3-liter V-6 that produces 340 horsepower and is mated to an 8-speed automatic transmission. The Land Rover Terrain Response system allows for superior off-road AND snow performance. Inside, the driver and passengers ride in almost matchless luxury in a vehicle that traces its heritage to the 1940s. In today’s world drivers have to sit with their legs extended to drive many top-level vehicles. Not in this one. The LR4 HSE Lux lets one sit upright while enjoying great visibility … and great capability. The honors keep piling up for Ford’s flagship vehicle. This winter, we’ve been seeing TV commercials that cite the F-150’s award as last year’s New England Winter Vehicle of the Year. Members of the New England Motor Press Association followed up this winter by voting the F-Series the Best-in-Class full-sized pickup truck. That comes during a week when the Insurance Institute for Highway Safety awarded the F-150 the only “good” rating in small overlap protection testing. The F-150 has been America’s best-selling pickup truck for 39 straight years and the country’s best-selling vehicle overall for 34. Ford did away with V-8 engines and switched to an aluminum truck bed in this latest generation of the F-150. The V-6s have proven to be strong and fuel efficient, and the aluminum beds have been holding up well and allow for greater towing capability. There are three cab styles—regular, Supercab and Supercrew—plus 6.5- or 8-foot beds. Toyota’s redesigned 2016 Tacoma earns the New England Motor Press Association’s Best-in-Class midsize pickup award in the organization’s 2016 Winter Vehicle of the Year balloting. The outgoing Tacoma was the country’s top-selling midsized pickup for all of its 10-year run. The new version is available in 29 configurations with two cab styles—extended access and double cab. Both are available as 4×2 or 4×4 vehicles with either a 2.7-liter 4 cylinder engine or new 3.5-liter Atkinson cycle V-6. We’ve found the new Tacoma to be an outstanding off-road vehicle with selectable terrain settings that help make it a solid winter-weather performer. If you want to document its winter abilities, there’s a standard Go-Pro camera mount behind the rearview mirror. Owners should appreciate the combination of standard locking tailgate and available tri-fold rigid tonneau cover. Victoria Van Guyse accepts the award on behalf of Mitsubishi at the 2016 NEMPA Annual Awards Dinner. The New England Motor Press Association takes its Yankee heritage seriously. 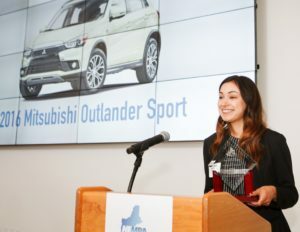 To consider a vehicle or innovation for a Yankee value or Yankee ingenuity award, the membership has to be impressed with a product or vehicle as a “value proposition.” So it is with the 2016 Mitsubishi Outlander Sport, a vehicle that has adopted a tried-and-true formula to be competitive—value. The folks at Mitsubishi offer extra features and a 10-year warranty to get shoppers’ attention in the competitive subcompact SUV/crossover segment. Reviewers seem to agree: It’s a good value both in quality, drivability, and price. Joe LaMuraglia, General Motors Broadcast Communications Manager accepts the award from NEMPA President, Craig Fitzgerald. Let’s hear it for one of the original SUVs. A version of the Chevrolet (or GMC) Suburban has been on the market since 1935. The concept is simple: Convert a panel truck into a heavy-duty passenger-and-cargo-carrying wagon with seats. Today’s SUVs, for the most part, are moving away from this body-on-frame truck-based construction in favor of becoming more car-like unibody vehicles. Not GM. Today’s Suburbans are true to their truck heritage. Yes, they’re big. And yes, it makes them hard to park in tight spots, but their ability to carry people and gear in ever-increasing comfort is unmatched. It’s a tradition that NEMPA is proud to salute. The New England Motor Press Association has selected the Toyota RAV4 Hybrid for a Best-in-Class Green SUV/Crossover award as part of its 2016 Winter Vehicle of the Year balloting. Toyota already has acclaimed hybrids in its Prius and Camry models. That technology has filtered into the Lexus lineup as well. After that, it was a natural progression to put it in and SUV. So Toyota did, creating the most fuel efficient, all-wheel-drive hybrid SUV on the market with a 33 miles per gallon EPA rating in combined driving. There’s good room for both passengers and cargo. There’s also surprising performance: It’s quicker than the gas-powered RAV4. The hybrid setup only is available in the top (XLE and Limited) trim levels. The powertrain operates as a front-wheel-drive vehicle in normal driving conditions, sending propulsion to the rear wheels as needed—such as winter driving in New England.